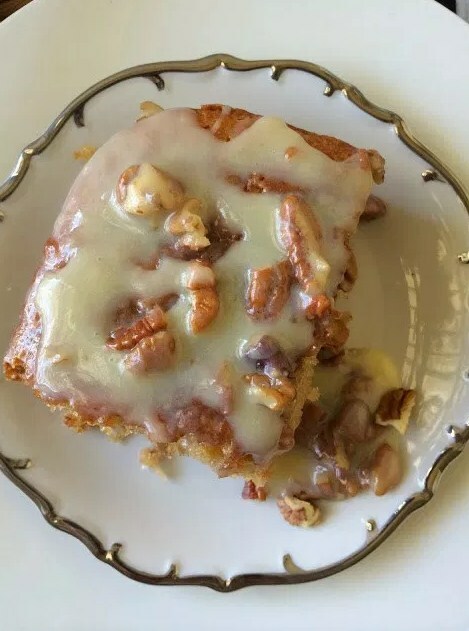 In a large mixing bowl, combine cake mix and the tub of coconut pecan, eggs, oil, and water. Mix batter until well blended before adding 1/2 cup chopped pecans. Pour the batter into a greased 9 x 11 inch baking pan. Check to make sure cake is firm with no jiggle and edges slightly drawn in from pan. Put cake aside to cook for a short period of time. In a medium saucepan, melt four tablespoons of butter before adding the can of condensed milk. Let the pan simmer on medium heat until the mixture appears consistent and heated. Add 1/4 cup of pecans to the mix and stir it all together. Moving quickly, poke holes in the hot cake. Then, pour the butter sauce over the cake until it slowly runs down the sides of the cake and covers the top. Allow cake to mostly cool before eating.